More and more people want hot tubs for their homes. Thanks to brilliant innovators and the companies behind them, consumers are no longer limited to the fixed, in-ground, concrete hot tub spa or the wooden kind that we know of. Different designs and configurations are being sold today in many stores and dealers. Prices also vary with more available options even for the basic and less expensive spas. Someone who does not mind paying more may choose to build a custom-made, in-ground spa alongside a swimming pool with its style matching with the house décor, while another person may go for a small portable hot tub with some of the usual features like massage jets big enough to accommodate a family of four. There are two kinds of portable hot tubs – one that is inflatable and another that is made out of hard, heavy-duty plastic. 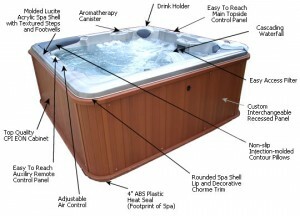 An inflatable hot tub is probably the least expensive hot tub with the basic models costing only a few hundred dollars. It usually has built-in temperature controls for easy adjustment and a mechanism that allows you to automatically inflate and fill it with air. It is made out of a special heavy-duty plastic called UPVC which is durable and will not easily get torn apart. Insulation is provided by the air that is pumped into it while some models may have additional coating. But you will of course need matching hot tub covers to help sustain hot water temperature for longer hours and keep the insides clean. Like many hot tubs and spas, this type comes in various shapes, sizes and colors. A portable spa is formed out of plastic composed of multiple layers of skin protected by a foam filling which provides the insulation needed to retain temperature. A good insulation material helps keep water warm for hours without having the need to constantly reheat. Another common feature of plastic portable hot tubs are built-in seats forged around the sides. Some may not like such feature as it takes up extra space and can cause difficulty when moving around. But most users do not mind since seats can provide the needed support when you in the tub for a long time. Temperature controls and most of what you need to operate already comes with the package. You can assemble your own newly purchased portable hot tub spa and be bathing in bubbles in just a few hours. It is common knowledge that a portable spa would naturally be less expensive to set up than an in-ground spa that is built from tiles. While low hot tub prices can a be major motivator to purchase a product, it is still impractical to buy solely on the basis of cost and not look at other factors. Being familiar with all possible pros and cons helps one make a smart choice wh en shopping for portable hot tubs and spas. Made from mostly light materials such as plastic. It can be moved and transported with the right equipment and vehicle. More affordable and easier to operate. It is usually easy to assemble and operate, especially with well written instructions and manuals that come with the unit. Inflatable tubs can be deflated and stored when not in use. It can last many years depending on usage and maintenance. Take advantage of stores that carry portable hot tubs for sale. If you are lucky, you will find the kind that you have always wanted at a very low price. 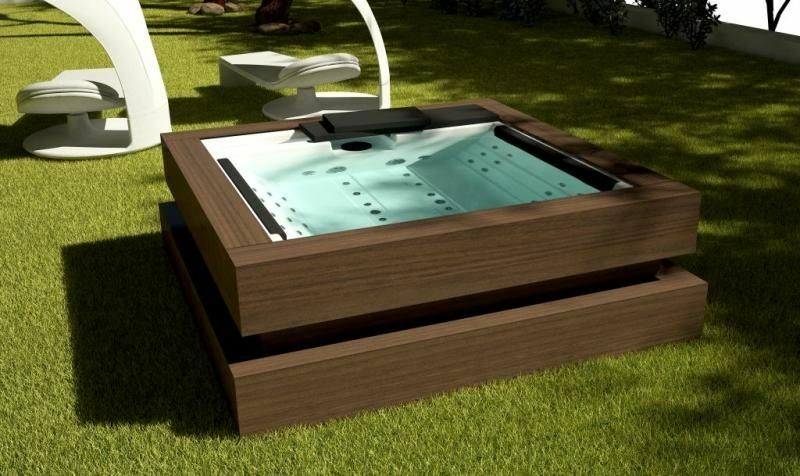 Can be used as an indoor outdoor hot tub. 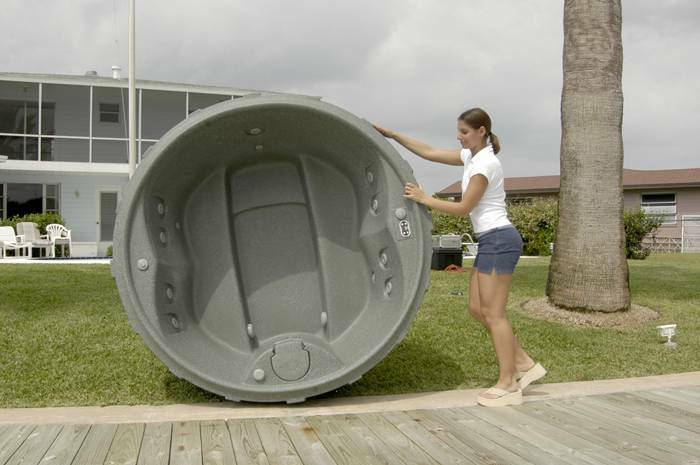 Certain portable spas particularly inflatable hot tubs can be fragile and prone to punctures. To prevent breakage, such tubs must be used, stored and cleaned with utmost care. Designs, colors and sizes are limited. You may even have to compromise when a certain style that you want is not available in stores. Highly customizable – you can select the type of materials (i.e. concrete, tiles, acrylic, copper, etc. ), shape and size. It can look great if built in a patio or wooden deck. It has the potential to be your home’s masterpiece and the focal point of your backyard. Imitate designs that you see in magazines or otherwise create an art out of your hot tub. You can choose to install it outdoors or inside your home. With great craftsmanship and proper maintenance, it can last a very long time. It can be really expensive and tedious to hire contractors or experts whether you are installing a big spa or even building small hot tubs. You may have to stay home for the duration of the project. It tends to costs a lot more to build, repair and maintain. It can take a long time to construct. Installation and plumbing can be both costly and complicated. You really need to find someone who knows what they are doing. An outdoor spa may be hard to use during winter or extreme weather conditions. When forged on the ground or deck, it would be impossible to move to a place where it is not exposed to hard rain or snow. You have seen how both buying and owning portable spas and concrete hot tubs have their advantages and disadvantages to them. Learning about the upside is always great and makes you want to immediately call the store to order. But it can get scary once you know about its quirks – like how it can get expensive and difficult to keep a portable spa in good condition. The thing about listing the flaws is not to discourage but rather to persuade you to plan ahead and to do more research. Checking multiple resources and a dozen portable hot tub reviews will save you a lot of money and hopefully keep potential problems away. This entry was posted in Portable hot tub and tagged cheap hot tub, Portable hot tub. Bookmark the permalink.